Electronic skin could be used for many applications, including prosthetic devices, wearable health monitors, robotics and virtual reality. A major challenge is transferring ultrathin electrical circuits onto complex 3-D surfaces and then having the electronics be bendable and stretchable enough to allow movement. Some scientists have developed flexible "electronic tattoos" for this purpose, but their production is typically slow, expensive and requires clean-room fabrication methods such as photolithography. Mahmoud Tavakoli, Carmel Majidi and colleagues wanted to develop a fast, simple and inexpensive method for producing thin-film circuits with integrated microelectronics. 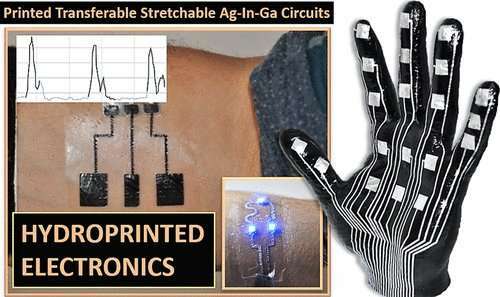 In the new approach, the researchers patterned a circuit template onto a sheet of transfer tattoo paper with an ordinary desktop laser printer. They then coated the template with silver paste, which adhered only to the printed toner ink. On top of the silver paste, the team deposited a gallium-indium liquid metal alloy that increased the electrical conductivity and flexibility of the circuit. Finally, they added external electronics, such as microchips, with a conductive "glue" made of vertically aligned magnetic particles embedded in a polyvinyl alcohol gel. The researchers transferred the electronic tattoo to various objects and demonstrated several applications of the new method, such as controlling a robot prosthetic arm, monitoring human skeletal muscle activity and incorporating proximity sensors into a 3-D model of a hand.